There are a few different ways you can assign your Code series parameters to control Cubase functions, but I'll show you the way to get it up and running quickly for immediate control of the transport, as well as the faders, buttons and knobs in your mixer. Hold down the SHIFT button and hit the C# key labeled "MACKIE/HUI" until the display reads "Mackie"
To allow some flexibility, the knobs, faders, and assignable buttons can send midi CC controls, Mackie Control, or HID messages, but for our purposes with Cubase, we want to set these to send as Mackie. Each bank of parameters will have a "Mode" button that will change colors based on the mode the parameters are set to. Simply, hit each mode button until it lights up green. The screen should read "MACHUI" to confirm. 4. Hit Apply and OK to exit the window and that's about it! You should have control over the transport, faders, knobs and buttons. If you do not already see your plugin folder in this window, click on the button labeled VST 2.x Plug-in Paths and click on Add to add a new plugin location. Now that your plugins have been scanned, we're ready to open one and start making some noise. 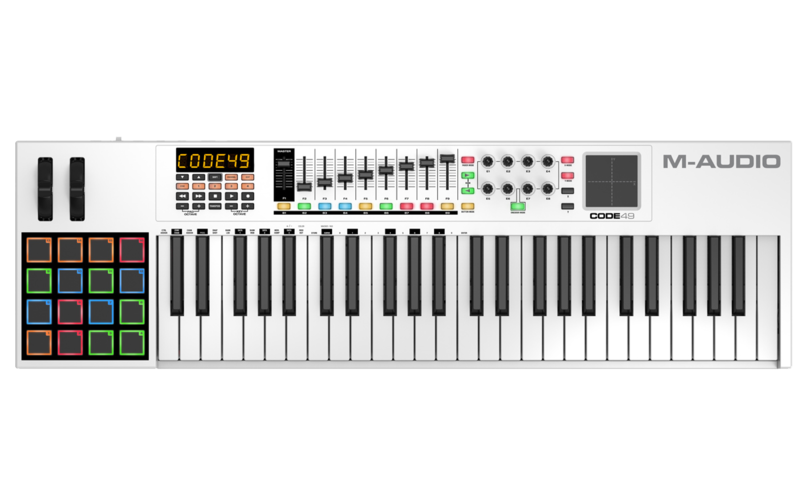 You should now be able to hit some keys on your keyboard and start playing your new instrument! *Important Note: The Makie protocol uses MIDI notes to communicate with the software. Because of this, you may find that pressing the transport buttons (stop/play/record) or moving a fader or knob is generating a sound. This is likely because your instrument track is set to respond to "All MIDI Inputs" including the Code Port 3 which is used to communicate the Mackie data. To stop this, simply make sure that your instrument track input is set to the first Code port and not "All" inputs.